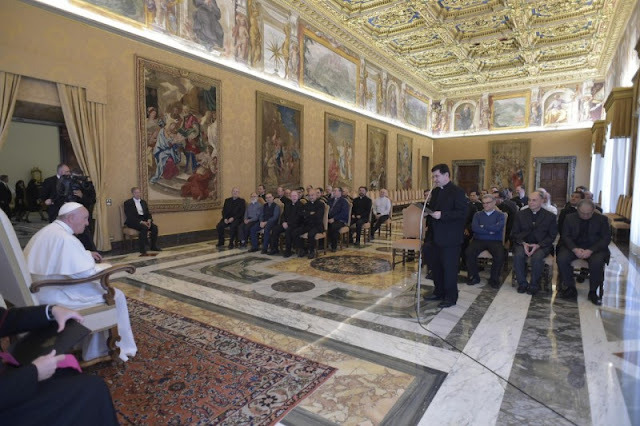 I am pleased to meet you on the occasion of your General Chapter and to address to each one my cordial greeting, to begin with the new Superior General, whom I thank for his words and to whom I wish every good for his ministry. At the center of your reflection these days you have placed the theme Meeting and walking. «Jesus walked with them» (cfr Lc 24,15). The reference is to the story of the disciples of Emmaus, who meet the risen Jesus along the way. He approaches to walk with them and to explain to them the Scriptures. The Chapter is a privileged moment of grace for your religious family, called to assume this dual attitude of the divine Master towards those who are the object of your pastoral care: to proclaim the Word to them and to walk with them. It is a matter of finding ever new ways of evangelization and of proximity, in order to fulfill your charism with dynamic fidelity, which places you at the service of migrants. Faced with today's migratory phenomenon, very vast and complex, your Congregation draws the spiritual resources necessary from the prophetic witness of the Founder, as current as ever, and from the experience of many confreres who have worked with great generosity from their origins, 131 years ago , until today. Today as yesterday, your mission takes place in difficult contexts, sometimes characterized by attitudes of suspicion and prejudice, or even rejection towards the foreign person. This motivates you even more to a courageous and persevering apostolic enthusiasm, to bring the love of Christ to those who, far from their homeland and family, are in danger of feeling far from God. The biblical icon of the disciples of Emmaus shows that Jesus explains the Scriptures as he walks with them. Evangelization is made by walking with people. First of all we must listen to people, listen to the history of the communities; above all the disappointed hopes, the expectations of the hearts, the trials of the faith ... First of all listen, and do it in an attitude of con-passion, of sincere closeness. How many stories there are in the hearts of migrants! Stories beautiful and ugly. The danger is that they are removed: the ugly ones, it is obvious; but also the beautiful ones, because remembering makes them suffer. And so the risk is that the migrant becomes a person uprooted, faceless, without identity. But this is a very serious loss, which can be avoided by listening, walking alongside people and migrant communities. Being able to do it is a grace, and it is also a resource for the Church and for the world. After listening, like Jesus, we must give the Word and the sign of the broken Bread. It is fascinating to make Jesus known through the Scriptures to people of different cultures; tell them about his mystery of love: incarnation, passion, death and resurrection. To share with migrants the amazement of a salvation that is historical, is situated, yet it is universal, it is for everyone! To enjoy together the joy of reading the Bible, to welcome in it the Word of God for us today; discover that through the Scriptures God wants to give these concrete men and women his Word of salvation, of hope, of liberation, of peace. And then, invite to the Mensa of the Eucharist, where the words fail and remain the Sign of the Broken Bread: Sacrament in which everything is summarized, in which the Son of God offers his Body and his Blood for the life of those travelers , of those men and women who risk losing hope and not to suffer prefer to cancel the past. The Risen Christ sends you today, in the Church, to walk together with many brothers and sisters who travel their way from Jerusalem to Emmaus as migrants. Ancient and always new mission; tiring, and sometimes painful, but also able to make you cry with joy. I encourage you to carry it forward with your own style, matured in the fruitful encounter between the charism of Blessed Scalabrini and the historical circumstances. This style is part of the attention you place on the dignity of the human person, especially where it is most wounded and threatened. This is part of the educational commitment with the new generations, catechesis and family pastoral care. Dear brothers, let us not forget that the condition of every mission in the Church is that we are united to the Risen Christ as branches to the vine (cf. Jn 15: 1-9). Otherwise we do social activism. This is why I repeat to you the exhortation to remain in him. First of all we need to let ourselves be renewed in faith and hope by Jesus alive in the Word and in the Eucharist, but also in sacramental forgiveness. We need to be with him in silent adoration, in the lectio divina, in the Rosary of the Virgin Mary. And we need a healthy community life, simple but not trivial, not mediocre. I appreciated when the Superior General said that the Spirit calls you to live communion in diversity among you. Yes, as a testimony but first of all as a joy for you, as a human and Christian, ecclesial wealth. I also encourage you to continue the journey of sharing with the laity, facing together the challenges of today; as well as to take care of the itineraries of ongoing formation. Brothers, I thank you for this meeting. I pray for your Chapter, which bears many good fruits! We ask this through the intercession of Our Mother Mary, of St. Charles Borromeo and of Blessed John Baptist Scalabrini. I warmly bless you and all the Scalabrinian Missionaries. And you too, please do not forget to pray for me.